So I'm sitting here exhausted, hot and thirsty. This doesn't stop me from drinking my coffee though. I drove home this morning as the eastern horizon began to glow and by the time I got to bed you could see by the gray early light. Five hours of energy then five hours of sleep later I'm contemplating my next move. I was supposed to work today but I don't care- everyone else is on vacation this week, why should I work myself to death? I spent the whole week in that hazy twilight of sleep deprivation, caffeine, alcohol and bad food. I spent every moment I wasn't swinging a paint brush or patching a wall or hanging a mirror (I work in construction) thinking, planning and scheming. Actually I did those things while working. After work, and while driving between jobs and on my lunch and breaks I was making phone calls, exchanging text messages and gathering intel. The question is always the same: where are the Hex? Where were they last night? Where exactly in three hundred miles of river system was there a spinner fall? Where will it be tonight? Where will it be next week? It's all a crap shoot. 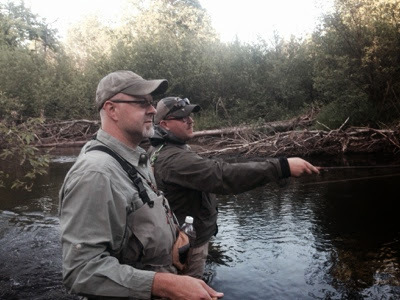 I fished with Tom Hazelton and his friend Adam the other night at a secret walk in location- no bugs and no fish. Not even on a mouse. I hear Zach hooked up on one not far from us though. 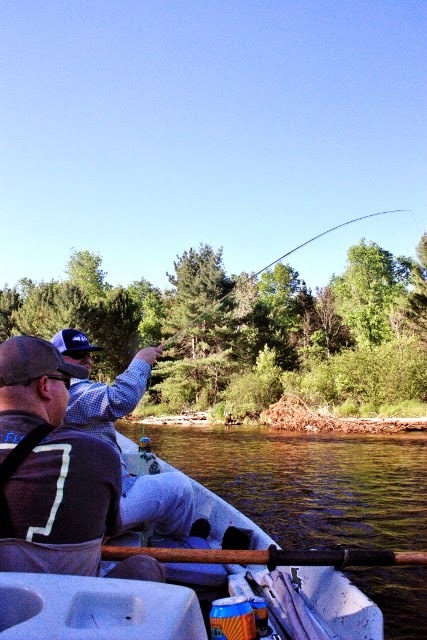 The next evening they floated the Au Sable and had a late spinner fall and even got an okay fish. I floated last night with Alex. We had a light spinner fall and almost no rising fish. 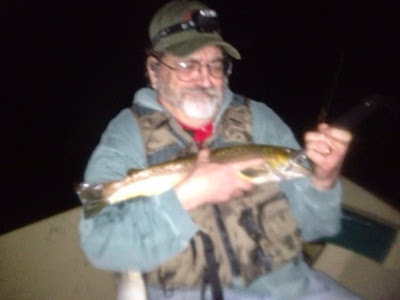 It seemed like everyone but us managed a decent fish though, and in the wee hours of the morning during a barely coherent and patently unsafe drive home that required dodging and braking for multiple deer, we talked about where we should have been, could have been. "We should have left earlier"
"We should have waited up above"
"We should have pushed down"
We should have, perhaps could have. 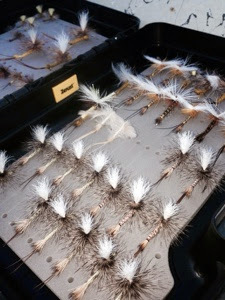 The truth is it was a weak spinner fall and the fish aren't gaga yet. 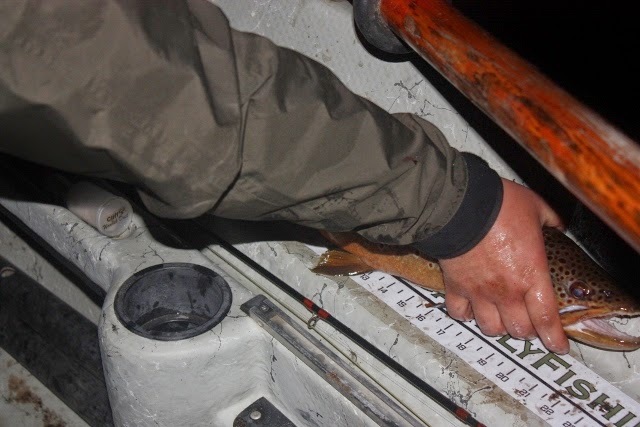 Late into the night, early in the morning, we set up on a steadily feeding fish. 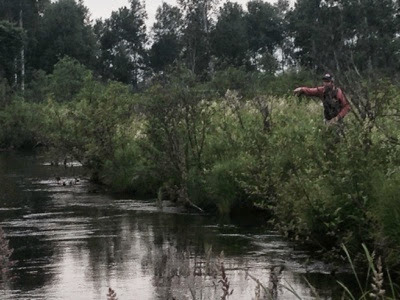 It was two feet off the bank in a back eddy with a big shrub just upstream of it. We worked this fish for an hour before getting it to eat. When it did there was a splash, and Alex' line jumped and then nothing. We heard a couple of blurps and splashes on our way out, but never found any more active fish, no more bugs on the water. And when we got back to the launch we broke the trailer. I didn't get Monday Morning Coffee done today, but I wanted to get something up on the blog. I'm starting to get this back-log of trips and posts, and I don't want to let FR to continue to languish away. 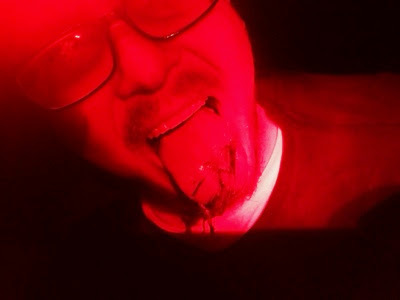 So here's a trip report. 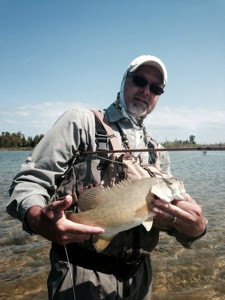 I got a message from Facebook friend Lee that he would be up north attending a bamboo rod event in Grayling. He's one of those people who like or comment on your social media posts but you don't know from Adam. He seemed like a decent guy and so I told him I'd take him fishing. He's a bamboo rod builder from southwest Michigan. 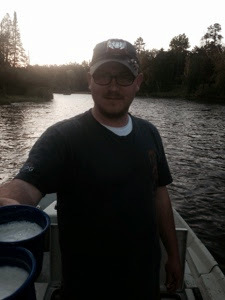 As it turned out he had also contacted my friend Alex Cerveniak and so the three of us fished the South Branch Au Sable Thursday evening. 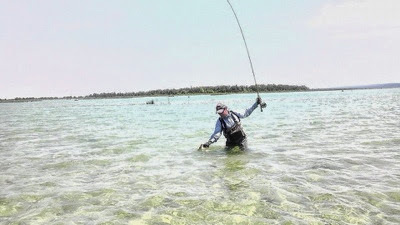 The bugs were scarce and the fishing was kind of a dud, but we agreed to meet again on Sunday and do some flats fishing. Lee had a 7 weight bamboo he wanted to flex on some carp and bass. Sunday came and we met early. We parked and started hiking down the beach trying to get away from the crowd. We didn't get far when we saw a pod of dark shapes in the surf- carp. We gave it a shot but the fish were restless. 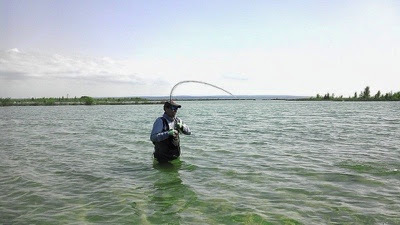 There was a hard northeast wind blowing and I wondered the effect it would have on the fishing. I also wondered how it would affect Lee's bamboo. We hiked for nearly an hour to the spot I had in mind. After some tricky wading in heavy current across open water we got into some sheltered bays and started fishing in earnest. The carp were a complete bust. The northeast wind had them skittish and spooky. Any time a boot or fly touched the water they scooted out. We didn't actually see that many carp. We saw a few dozen whereas my last trip I saw hundreds. The bass were another story. We weren't out long before Lee was into a small bass. 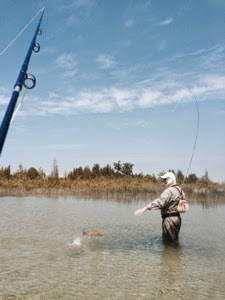 It put a pleasing bend in his rod and a smile on his face. 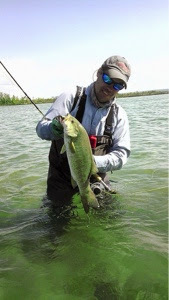 Then he found a pod of them in a spot of green water with obvious big boulders. He landed two fish before I could even get there. 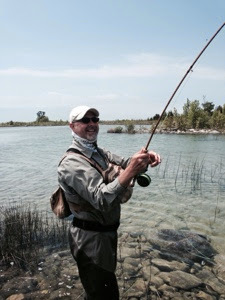 Most were small, but Lee caught a decent one and we had much larger fish chasing our hooked fish. After that we hopped over into the next back bay and went to town. We got several fish in the 4-5 lb. range. It was fantastic. The carp remained aloof to panicked. Around 5 PM we looked at each other. We were sun-tired, wind burned and cast-sore. We had caught about forty bass between us. It was a slow day for the location, but still a great day. After the first hour we never saw another soul. It was just us, the wind, waves and seabirds. We hiked the north shore back. 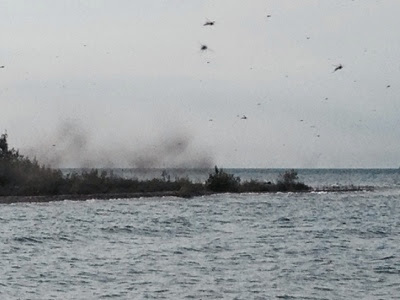 The midge hatch began in earnest, and they lifted from the low shrubs like black smoke. We had to wear our buffs to keep them out of our mouths and noses. The whine of their wings drowned out even the surf and wind. And when we got back to the car clouds of mosquitoes, big as bats, brought us back to earth. Almost. Yyaaauuuucccchhhh!! Yawn stretch, scratch, repeat. It's Monday morning, so let's have some coffee. I know- it has been a few weeks since I've shared MMC. My buddies are giving me grief over it. I've done my usual early summer thing and way over-booked myself with work, which makes it difficult for me to write or do much for the blog. The last two years I had booked my entire summers solid with work. Not this year. The good news is I finished my side job yesterday which should leave me free to fish and write more, and hopefully get FR back to resembling a blog. I have several good posts in the works. I've been getting some fishing in as well. I've given up any notion of having a normal life or sleep schedule. I work and I fish. I eat and sleep occasionally. Sometimes I see my girlfriend. 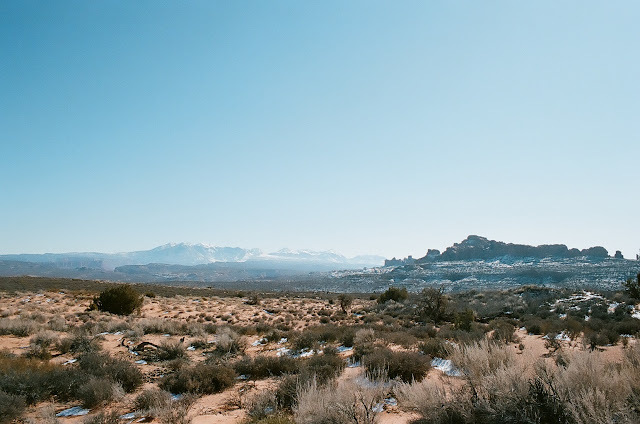 I was going to write about my last three outings on this post but it quickly turned into 3,000 words- way too long for Monday Morning Coffee, so what I’ll do is break it up into three posts over the next three days. Here’s a brief synopsis. 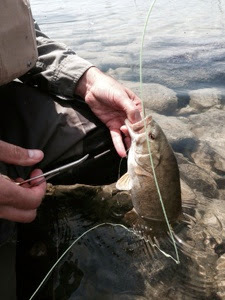 I got out flats fishing for carp and smallmouth ten days ago and had a fantastic trip. 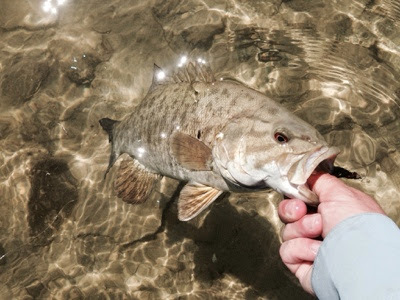 The carp bite this month has been nothing short of phenomenal and I caught a monster smallmouth. Then last Sunday I got to float the South Branch Au Sable River with Alex Cerveniak and Cameron Mortenson of The Fiberglass Manifesto. 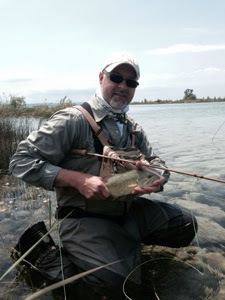 We fished the brown drake hatch and caught fish. Cameron made me cast glass. He didn’t have to try that hard. Two nights later I floated again with Alex and friend Dave Smethurst. It was another fantastic float, a night in which I felt I could do no wrong. To sum it up- despite a tough work schedule (50+ hours/week for my job plus side work) I have gotten in some quality trips and caught some big fish. So yes, it's worth tuning in for. Well, I'm almost out of coffee and it's time to go to work.